Just because you never learned to play the sax or keyboard doesn’t mean you wouldn’t enjoy tinkering and steering the sounds they’re capable of creating. If you want to do just that, you need to get your hands on the Beamz. It’s a new kind of musical instrument that lets you create and play music with notes from a variety of instruments in a way you wouldn’t have imagined before: by dancing, or sort of. So how do you play it and why is it called Beamz? Its name references the laser beam triggers the product uses to manipulate sonics. Laser beam paths are created and with your hands, or arms, you can break the paths and create a wonderful and rich array of sound. 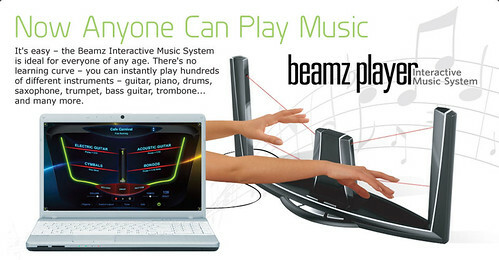 No matter what your musical skill level is, you can use the Beamz to make music and have fun. In essence, you’ll be playing with light when you’re jamming with the Beamz. The best part is that you’ll always sound great — you won’t get off key or throw out your pitch. Moreover, the interactive system comes with an extensive music library housing current hits and everyone’s favorite dance tracks of yore. In the Beamz library you’ll find jazz, rock, classical, hip hop, and pop — anything and everything when it comes to musical genres. With so much versatility, and its being so easy to learn to use, this is a music player that’s recommended for people of all ages and musical abilities.